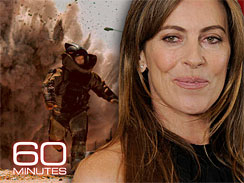 Lesley Stahl talks to Academy Award best director nominee Kathryn Bigelow about her award-winning film, “The Hurt Locker.” If she’s chosen, she would be the first women ever to win in that category. Tom Anderson is the Producer. Coleman Cowan is the Associate Producer. Bigelow was a painter before she was a film-maker and is still something of a recluse. But now she spends a lot of her time walking the red carpet. “The Hurt Locker” has already won just about every major critics’ award — plus Film of the Year from the Producers’ Guild And Best Director award from the Directors Guild. If she wins the big one, she’ll be the first woman ever to win an Oscar for directing.